I would like to join a covenant group! I'd like to speak to a pastor about being involved in a covenant group. A "Covenant Group" is what we call our small group ministry. As a part of our call to be "God's caring family", we encourage everyone who calls First Covenant home to become more involved by joining a covenant group. Covenant groups involve two aspects of ministry. First, each group meets regularly (most meet weekly, but some meet bi-weekly). Secondly, every group participates in some form of compassion or justice ministry together on a regular basis, up to once a month. Someone once said, "Those who can play together can pray together." We hope that in these less formal gatherings, all sorts of people will find the right comfort level and freedom to be able to pursue God together, whether that be through reading scripture, intentional prayer time, service projects, book studies, a DVD series or... whatever your group decides! As you build your relationships with on another while pursuing God together, we believe that the bonds of this community will strengthen and the kingdom will be expanded. Whether you know you'd like to join a covenant group or even if you'd simply just like to learn more, please enter your information in the boxes to the left and we will do our very best to answer whatever questions you have. 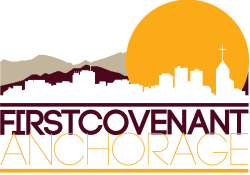 If you would like to join a covenant group but have specific needs such as handicap access, or need childcare, please leave us a note in the comment box. Quyana! (Thank you).